Spectrum has been fortunate to be able to take part in two of the Chippewa Valley Council of the Boy Scouts of America programs this year; the Explorers Program and the latest one, the Manufacturing Boot Camp which had a kick off at Spectrum on the week of June 13, 2016. 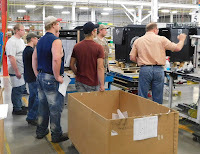 The Manufacturing Boot Camp program gives an opportunity for 16 to 18 year olds to gain firsthand experience with manufacturers to see what happens inside local businesses, summarized Alyssa Kellagher, Exploring Executive with the Chippewa Valley Council Boys Scouts of America. 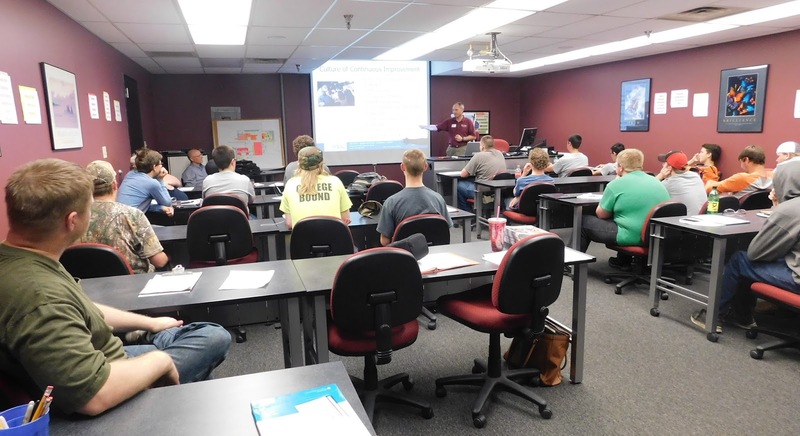 With the boot camp, they are working with approximately seven different businesses all within the Chippewa County. The format of the program is a six-week long course, taking place Monday through Thursday, with the students at a different business every week. In the morning they complete certifications and in the afternoon they are more interactive within the business site. Of the 23 participants in the program the majority of them just graduated from high school or are going to be seniors along with a few that are going to be juniors. A good handful of participants are going to be looking for employment right away, explained Kellagher. “The program has a large population of students that are more kind of alternative learning and so they're more hands-on and kind of need a little push to help them get certification that will make them be more marketable to employers as they are looking for to be hired,” she said. The week they were at Spectrum, students received an overview of the manufacturing facilities, offices, and product display room. They got a full overview of Spectrum including information about Spectrum’s design process, manufacturing cell layout, time studies, and packaging methods, and Spectrum’s furniture for presentation and education. Later in the week, Laurie Reardon, human resources, worked with them on resumes and interview skills to round out their experience. As for certifications while at Spectrum, Bonnie Burke of Workforce Resources lead them through the OSHA 10 training, which provides training for entry level workers and employers on the recognition, avoidance, abatement, and prevention of safety and health hazards in workplaces. 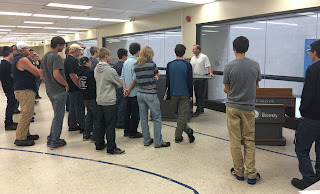 Additionally, UW-Stout Manufacturing Outreach Center’s Ted Theyerl and Bob Oliver taught students on lean manufacturing, quality, and how to establish a safe and efficient operation. The program is in its first year, said Kellagher, and is a joint effort with the Boy Scouts of America, Workforce Resource, and the Chippewa County Economic Development Corporation (CCED), as well as the businesses of Chippewa County. The Chippewa Valley Council BSA was awarded a grant through the State of Wisconsin’s Blueprint for Prosperity program. The original vision came from Charlie Walker with the CCED, said Kellagher. Walker was the one who inspired the main idea and then he works with them to apply for the grant. The CCED is the link between the program and the businesses that host boot camps. Workforce Resource partnership includes recruiting of students and helping with certification. And although Workforce Resource has done similar programs with adults, there really hasn't been a similar program out there before that has been geared towards 16 to 18 year olds. And what exactly are the students taking away from the boot camp? Beside the OSHA 10 and Lean Manufacturing certificates, they are achieving certifications in Critical Core Manufacturing Skills from CVTC and Safety and Manufacturing Processes and Production from the Manufacturing Skills Standards Council. Along with getting some firsthand experience of what goes on in local businesses, and knowledge of the hiring process, the participants will receive a stipend of $1,044.00 for completing the Boot Camp. High school elective credits will also be available for students from the Chippewa Falls Area Unified School District. But the benefits aren’t just for the participants. One thing that stood out for Kellagher was that there are two students participating in the Manufacturing Boot Camp that were also in the Explorers Program held at Spectrum. “I thought that was pretty cool that they had a good experience with the program and that they decided to do the boot camp,” said Kellagher. Kellagher also said that she could see that a lot of the other participants haven't been in a manufacturing site, and that even just being at Spectrum and getting a tour sparks the participants’ interest. That “spark” really stood out when they could see the finished products in the product display room because they had a lot more questions.